a rarity in a house with way too few boundaries!!! Love your illustrations!! So fun! Lets see my hidden talents??? I only made really good fluffy oatmeal one time. And I am not kidding. I don't know what I did but I have not been able to recreate it again?? I use to be able to turn my eyelids inside out??? I can't do it anymore. Gross!! That was my parlor trick! Love this painting. Now I'm hungry for a bowl of your secret talent. As for mine? I'm the family spell-check. Wow, I got hungry just looking at the cereal boxes. Nice job. Ummm, I'm ....hmmm...:) Have a nice weekend. you sure are good at those illustrations. amazing to my eyes. I love something called Cream of Wheat It is much like your porridge I think. What a fun post, and fun to see a glimpse of breakfast in your neck of the woods. I know how to drive a tractor -- how's that for a secret talent? Uncle Toby would be proud of your endeavors both in the drawing realm and in the cooking department too I am sure! I like the boxes! Love your secret talent... and your not so secret talent of painting pictures of the box holding ingredients for your secret talent. Oh dear, I think I've confused myself. :) Thanks for a fun post! Happy PPF! What a great talent. I can read tarot cards. i love your cereal boxes and that's no mean talent you have-mine often ends up boiling over the top of the bowl and creating a sticky mess in the microwave! i did have a party piece many years ago when i was young and carefree involving a cigarette that got dismantled and reassembled perfectly with a slight addition but i don't think its entirely legal so i'll leave it there! Wonderful illustration!! I'd love to see a set of those framed in a kitchen somewhere!! If only I had a wall left. I am a jack of all trades master of none!! If I tell you it won't be a secret any longer!! But I LOVED reading all the comments and will be back to read more later!! Love oatmeal too but still do it old school on the stove!! Great illustration!! 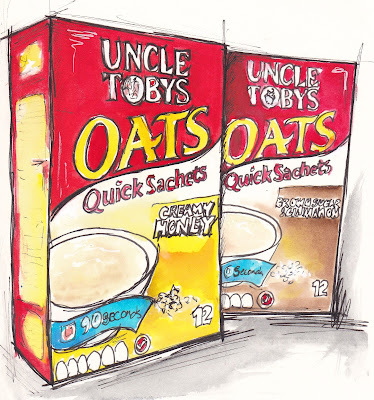 I LOVE a bowl of hot porridge on a winter's morning. I love porridge, and I had a great recipe which I can't find anymore, and as we don't have microwave porridge over here, I just use the "short cut version", i.e. Wheetabix. But I was once "famous" for both my noodle soup (so many noodles that there's hardly any soup left) and making the perfect semolina porridge/pudding (without any recipe to follow). I still love my noodle soup, but I haven't tried the semolia for years, as I'm too afraid to not get it right anymore... Love your porridge drawing! You have my salute of making a world class microwave porridge! :) Loving your illustration - lively and crisp line work! 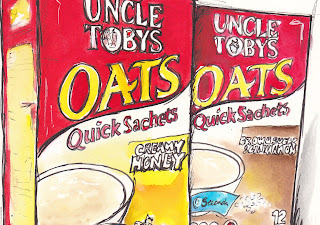 Porridge making is truly a great talent, lucky your family doesn't get the perfection of hot oatmeal on a cold morning, you'd be making gallons of it instead of one bowl. My secret talent is knowing where people left their stuff. Kept me employed for years, because my boss lost everything he picked up, and I always knew where he left it. I love how you give every day things a story and turn them into art. I am a pro at microwave popcorn! I'm not sure what that says about our cooking skills! I love this piece. Both your art and your writing are always a joy to see and read. I am not sure what my secret talent is. I will think about it and get back to you as I will be back later to see what comments others leave. Thank you for your advice today. I really appreciate the help. 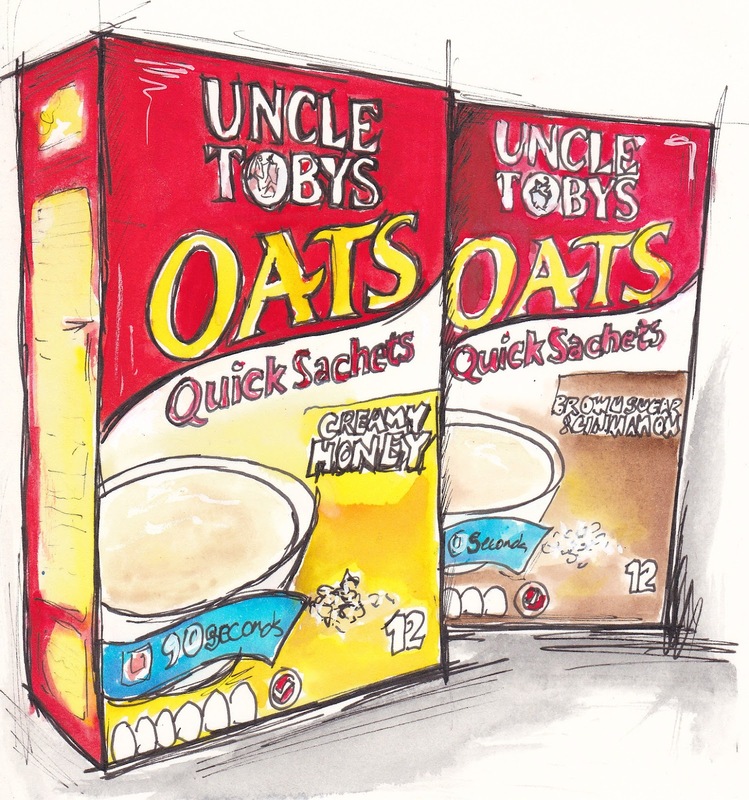 I am a great admirer of your talent of being able to paint just ordinary things and make them look beautiful, like these boxes of oatmeal. Amazing. I want you to know that I make microwave oatmeal every day for my breakfast. I put 1/4 old fashioned oats in a Corelle bowl, put water to cover, and microwave it for 3 minutes at 30%. Perfect every time. 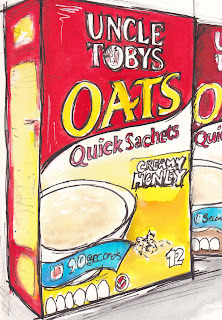 I only use Quaker Oats, though. LOVING this post- so funny and fun and of course, beautifully done! My secret talent? I make the perfect glass of water- seriously; everyone in the house comes to steal from mine and they all swear that theirs never tastes as good! 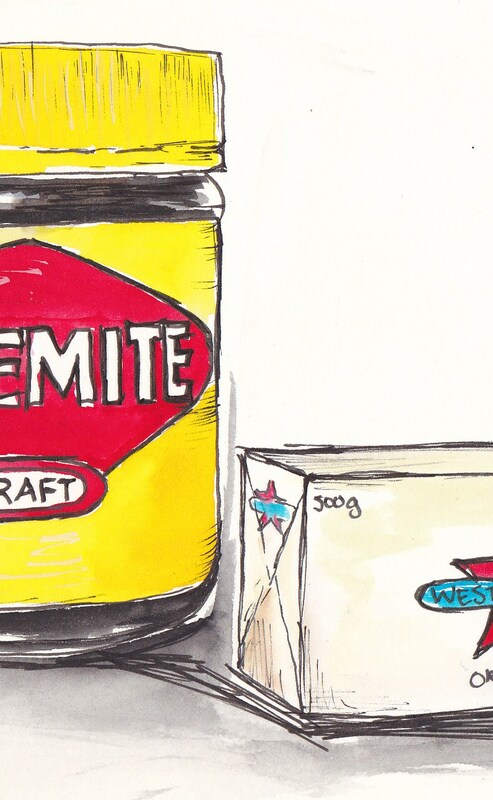 What a fun post & great illustrations! My hidden talent would be putting together a home cooked meal at the last minute using whatever is in the fridge! My hidden talent? It would have to be selecting tv shows that will fail in 1 season, or less. The shows I tend to love are rarely around more than 1 season. Yup, that is my secret talent. It was really rough the season we were a Neilson family- we did our best to save my favs, but alas, it was not enough. Your writings always crack me up - you get extra points for that:-)My secret talent... hmmm.. maybe somehow putting dinner together anyway though there seems to be nothing worth eating in neither the freezer, pantry nor refrigerator. 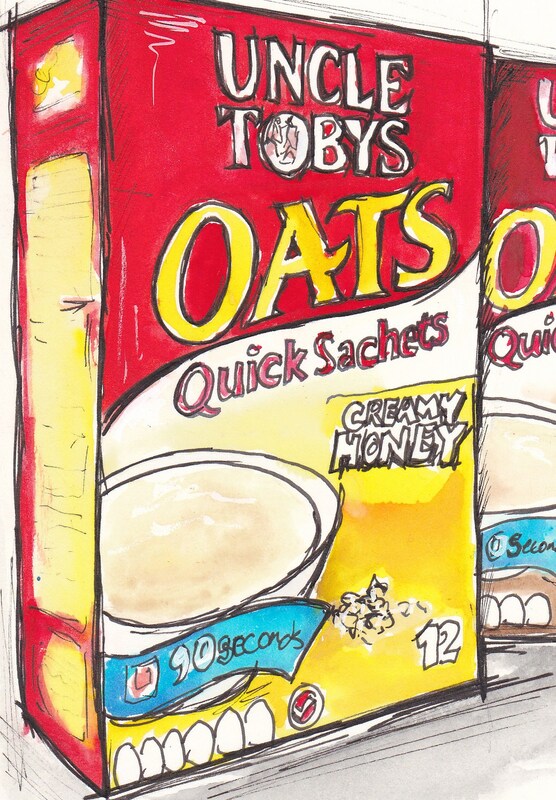 loved seeing your porridge art! So creative! I don't think I've ever had porridge but I wouldn't mind trying some. :) Love your work! Your sketches..? Illustrations.. are wonderful. Happy PPF. Yup, you're absolutely right, we should all celebrate our unusual talents. Raa Raa for those wonderful little things we can secretly be proud of!! I'm the best in the world at cooking scrambled eggs. Yup, I totally ROCK. The eggs are cooked enough to not be runny and to hold their shape but have a buttery creaminess that's hard to capture. Expert, I tell ya! This is great, I really enjoyed this post...now I'm all admiration and appetite.. :) I can play a pretty good 'Scotland the Brave' on the bagpipes but I rarely have time to get my set tuned up. Have a great weekend! 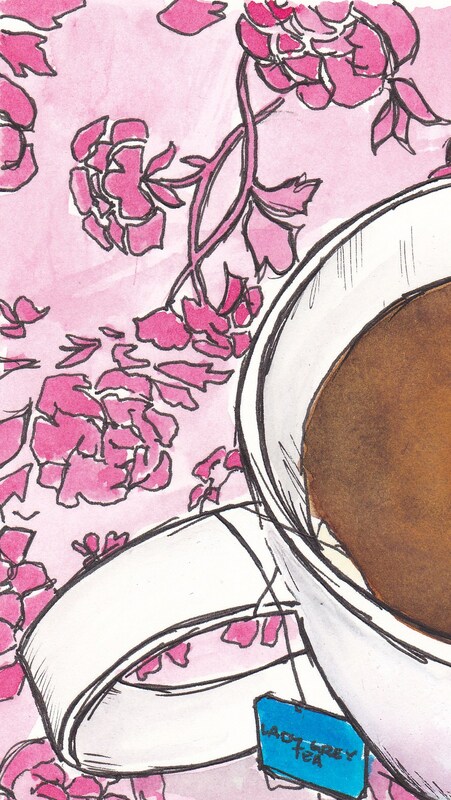 I love your post and art, as always, your site makes me smile! I have been enjoying reading everyone else's secret talents....i think my secret talent is frying bacon evenly.... I don't cook very much but the bacon is always my job! Cute post! I, too, am thoroughly impressed with your awesomeness!! What a fun collection of secret talents! Who knew there were so many secrets out there in the world? Mine? Hmmm. I don't cook much so won't claim any secret ability there. I can roll and/or curl my tongue (can't touch my nose, tried it just to confirm)AND, probably more helpful, I have an excellent internal measurement scale. Building something? I can tell you it's 1/4" off. Hanging art? I can tell you it's not even by 1/16" inch. etc. Instead of helpful my husband finds it annoying! Sheesh.